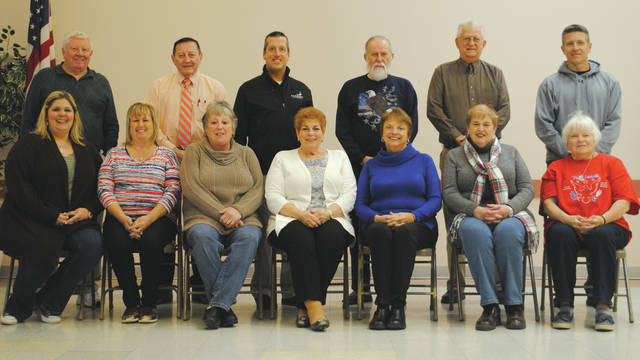 Whitney Vickers | Greene County News Although the Fourth of July holiday is months away, the Fairborn Fourth of July planning committee is in the midst of putting together the city’s annual celebration of the nation’s independence. Pictured in the back row from left to right include members Paul Newman Sr., Tony Babiarz, Pete Bales, Jim Bishop, Fred Pumroy and Sgt. Willard Watts. Pictured in the front row from left to right are members Jamie Brauer, Linda Butler, Ellen Slone-Farthing, Ruth Strasser, Connie Newman, Ellen Brunson and Mecca Brzeczek. Although the Fourth of July holiday is months away, the Fairborn Fourth of July planning committee is in the midst of putting together the city’s annual celebration of the nation’s independence. Pictured in the back row from left to right include members Paul Newman Sr., Tony Babiarz, Pete Bales, Jim Bishop, Fred Pumroy and Sgt. Willard Watts. Pictured in the front row from left to right are members Jamie Brauer, Linda Butler, Ellen Slone-Farthing, Ruth Strasser, Connie Newman, Ellen Brunson and Mecca Brzeczek. https://www.fairborndailyherald.com/wp-content/uploads/sites/50/2018/04/web1_fourthjulycom.jpgWhitney Vickers | Greene County News Although the Fourth of July holiday is months away, the Fairborn Fourth of July planning committee is in the midst of putting together the city’s annual celebration of the nation’s independence. Pictured in the back row from left to right include members Paul Newman Sr., Tony Babiarz, Pete Bales, Jim Bishop, Fred Pumroy and Sgt. Willard Watts. Pictured in the front row from left to right are members Jamie Brauer, Linda Butler, Ellen Slone-Farthing, Ruth Strasser, Connie Newman, Ellen Brunson and Mecca Brzeczek.